A 1000-year-old Viking is discovered frozen on the slopes of Mt, Hood, Oregon - three thousand miles further west than any previously known Viking exploration. While the world focuses on this remarkable discovery, Josh Kinninger's world is falling apart. Three personal catastrophes have left him bitterly angry and emotionally unmoored. Inspired by the Viking discovery, Josh begins his own westward journey to wreak a bizarre vengeance on the morally corrupt individuals who have piqued his ire. As we read of how that Viking comes to reside in Oregon, we also discover that Josh isn't the only Kinninger who attempts to run away from his problems - and the problems of his country - by heading west. 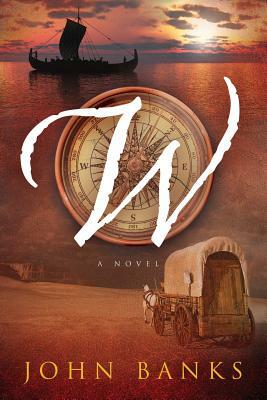 Josh's ancestor Jefferson undertakes a journey by wagon train to Oregon to escape the violent strife preceding the Civil War; and Jefferson's namesake descendant, one hundred years later, begins his own journey west to leave behind the Jim Crow South to make a new life for himself in San Francisco. By turns comic and tragic, W weaves many stories and styles into a rich literary tapestry.